As the Texas Tech University Health Sciences Center El Paso (TTUHSC El Paso) campus grows, so does its police force. 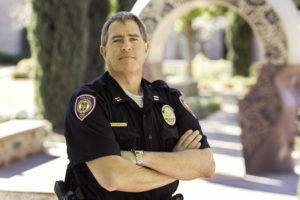 The Texas Tech Police Department (TTPD), headed by Chief Kyle K. Bonath in Lubbock, recently appointed long-time TTPD veteran Captain Doug Holley to oversee the department at TTUHSC El Paso. Long-time Texas Tech Police Department veteran Captain Doug Holley was recently appointed to oversee the department at TTUHSC El Paso. Holley, formerly a lieutenant with oversight of the regional TTUHSC campus in Amarillo, was promoted to captain in January, at the same time his appointment to TTUHSC El Paso was made official. Holley is the first-ever police captain assigned to TTUHSC El Paso. Prior to his appointment, lieutenant was the highest rank for the TTPD in El Paso. Holley said the captain position “helps bring more of a command presence” to the El Paso campus. He leads a team of 11 police officers and 31 civilian personnel, including security guards and administrative support staff. As part of the transition to his new leadership role, Holley spent a good part of the beginning of the year traveling between El Paso, Amarillo and Lubbock. But with that now behind him, Holley has settled in and is enjoying the new job. “I’ve been making the rounds (to university departments) and introducing myself to all the folks around campus,” Holley said. Holley has more than 30 years of law enforcement experience. He got his start after high school, when he enlisted in the U.S. Army as a military police officer. His first duty assignment brought him to West Germany, where he provided security for three-star generals and their staffs, as well as visiting dignitaries. He also gained two years of valuable experience as a military police investigator. Upon leaving the Army in 1993 after six years of serving his country, he was hired as a guard for the TTPD. Over time, Holley steadily climbed the ranks of the TTPD, from police officer to administrative sergeant. He took on a variety of responsibilities, including training employees, managing crime prevention programs and serving as the TTPD’s terminal agency coordinator for the Texas Law Enforcement Telecommunications System (TLETS). After nine years of service with the TTPD, he left the department to become a regional campus facility manager for TTUHSC. His law enforcement experience was valuable as a facility manager, particularly in facility security to ensure the safety of students, faculty and staff. During this time, Holley maintained his police commission through the TTPD, serving as a security consultant and performing some law enforcement duties. Holley returned to the TTPD in Lubbock in 2013 as information technology sergeant. He was promoted to lieutenant in 2016 and given command staff duties at the TTUHSC Amarillo campus. 2018 brought Holley a new title, new responsibilities and a new city for him and his family. “My wife Patricia and I are looking forward to living in El Paso,” he said. Holley said he is excited about leading the police department on a campus that is steadily expanding its educational, research and administrative facilities, as well as growing in numbers of students, faculty and staff.